My book, The Spiritual Dimensions of Vedic Astrology, began shipping on the 1st of October, 2005 and has been selling globally since then. The book is of vital interest to all serious practitioners and students of Jyotish who wish to delve deeper into the spiritual underpinnings of Vedic astrology. This web page gives several options for ordering the book, as well as introductory information. My original desire in writing this book was to teach and research the brilliant Drig dasa, a timing method which predicts key spiritual events in the lives of spiritual aspirants and great masters. However, as the pages of the book unfolded, it became clear to me that the link between the sacred writings of the four original Vedas, and the astrological science known as Jyotish, needed to be established first. So, although I started this project researching the classical timing method of Drig dasa, I first sought to present the Vedic conceptions of creation, time, and astronomy as foundational knowledge for the study of spirituality in Jyotish. Thus, the book is divided into two parts: Part One discusses creation, the karmas of the living beings, Vedic cosmology, and many key essentials of interpretive Jyotish; Part Two introduces Drig dasa, its purpose and method of calculation, plus many example charts as illustrations. What Are Some Well-Known Vedic astrologers Saying About The Spiritual Dimensions of Vedic Astrology? 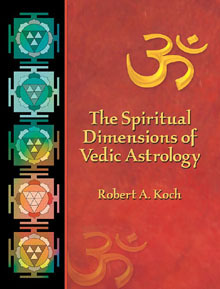 “This excellent work by Robert Koch sets a new standard for both student and practitioner of the sacred science of Vedic Astrology, and the book should soon become a requirement for serious students, especially those who are courageous enough to venture into the vast and unfathomable ocean of Parashari and Jaimini Jyotish.” – Brendan Feeley, M.A., N.D.
You can conveniently use this web page to purchase my book using PayPal. All orders will be shipped via US Priority Mail ($5.00 to destinations within the continental US), or by US International Priority Mail ($16.00 to $22.00 to most other countries throughout the world). For all orders, please provide name, phone number and email address, as well as shipping address.